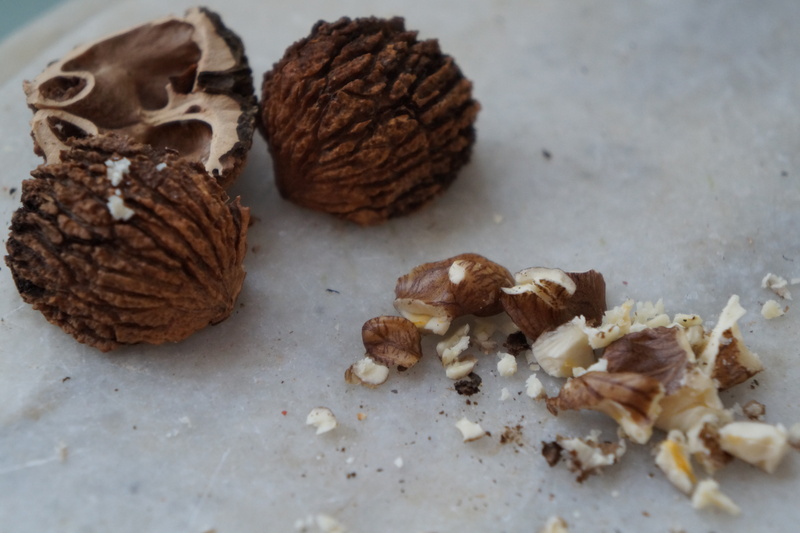 I only recently considered walnuts as an ingredient for soup, so when I looked on line for some recipes was surprised by how many are out there – bouillons, thick vegetable soups, Chinese dessert soups, even a few which featured my theme of the week – black walnuts. I did try one from a blog I follow which made good use of the strong flavour of black walnuts with squash. After that first success, I made my own with ingredients I happened to have on hand, namely Jerusalem artichokes, cremini (brown) mushrooms and walnuts. The combination of these local flavours worked really well, although I would not discourage anyone from coming up with other ingredients, maybe cauliflower, turnip, cabbage or whatever. There is no need for stock in this soup, as the flavours of the nuts and vegetables are strong enough on their own. The artichokes were the last of the ones I dug up in the fall. I intended to cover my patch with mulch, and just rake it back over the winter months for some freshly dug ‘chokes. With all the snow we have had and the super low temperature, just as well I did not bother. All the more for spring. 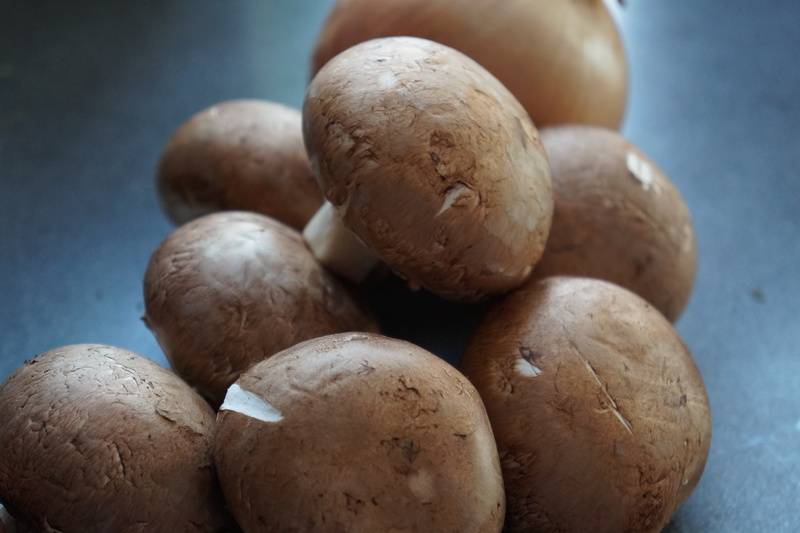 Cremini are of the same family as the white button mushrooms and are often sold next to them, at a little higher price. They are simply white mushrooms which are allowed to mature, which means they are sturdier and have a stronger flavour than the ‘babies’. If allowed to grow even larger, you get the portobello. These ‘browns’ keep well covered in the fridge, and although any mushrooms will work in this recipe, I was glad to have these on hand. 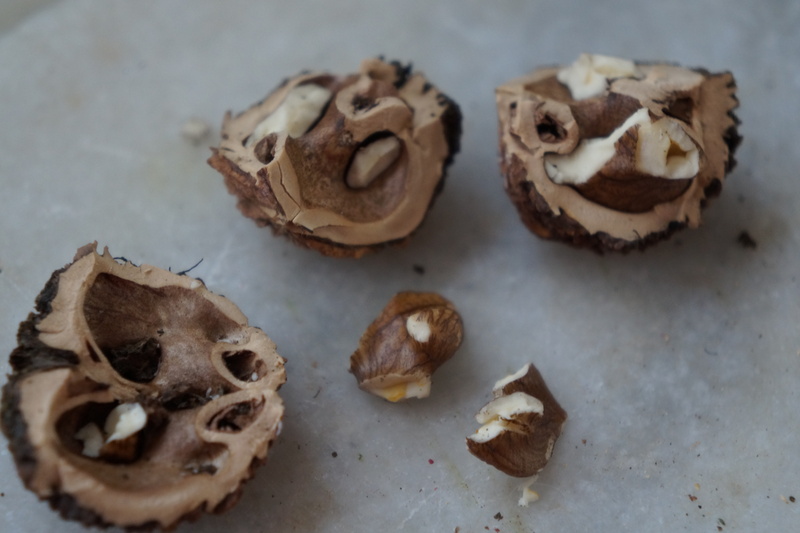 Further to my last post on walnuts, I managed to photograph one walnut cut open. You will see the difference between it and other walnuts. The nut is lighter in colour, with a much darker skin covering. It is smaller, and because of the tough shell, it is difficult to remove all in one piece. But a little goes a long way, and chopping helps spread them around. 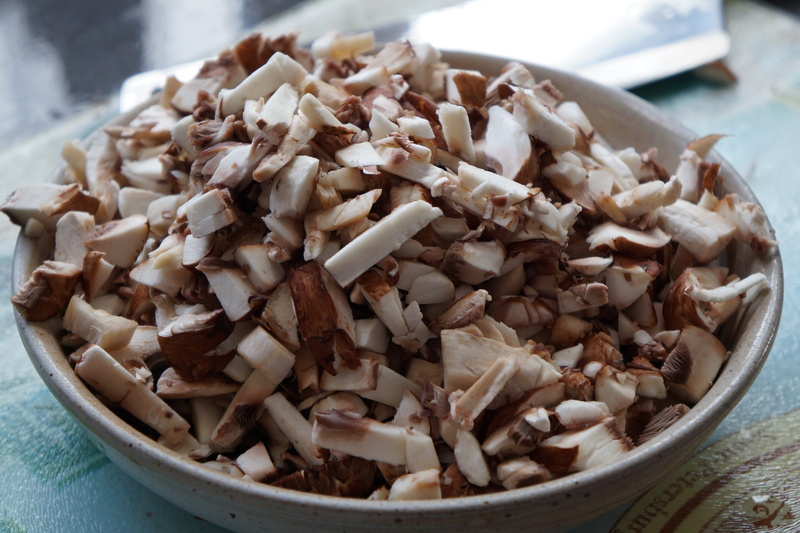 By the time you extract the nut from the shell, the chopping is all done. Boil the artichokes until soft and peel them. Blend them in a blender or food processor with half the water. Fry the onions in the oil until translucent. Add the mushrooms and continue frying until they are cooked. Add the walnuts, Jerusalem artichokes, salt and the rest of the water. Simmer to heat through for about five minutes. Garnish however you like, if at all. I put some sumac powder on it for a bit of colour and flavour. 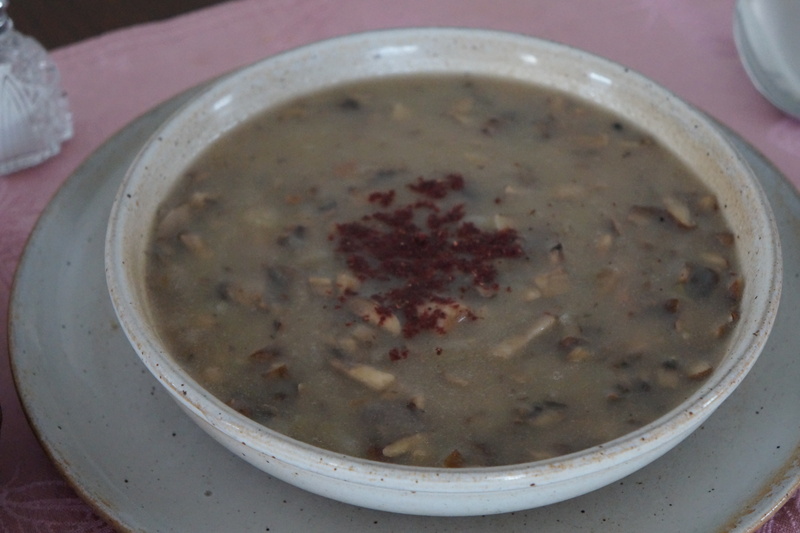 Categories: jerusalem artichoke, soup, wild nuts | Tags: black walnut, brown mushrooms, cremini mushrooms, foraging, jerusalem artichoke, locavore, soup | Permalink. 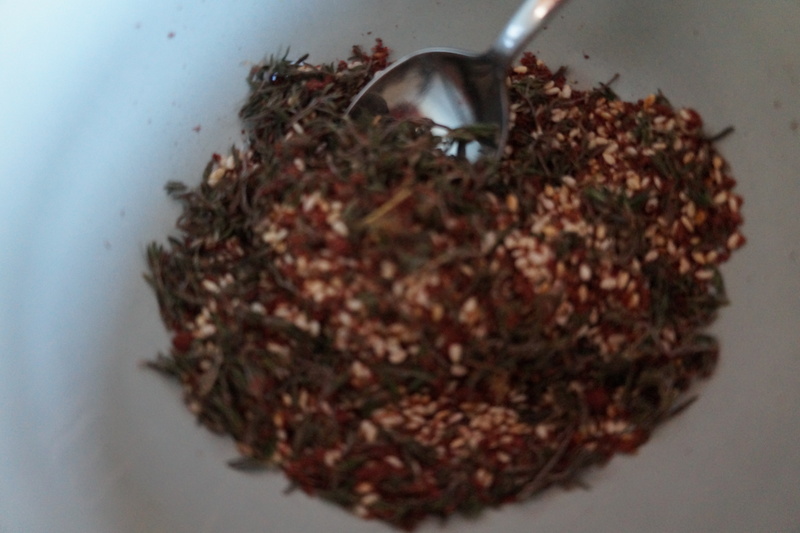 What is Za’atar and How to Make it? 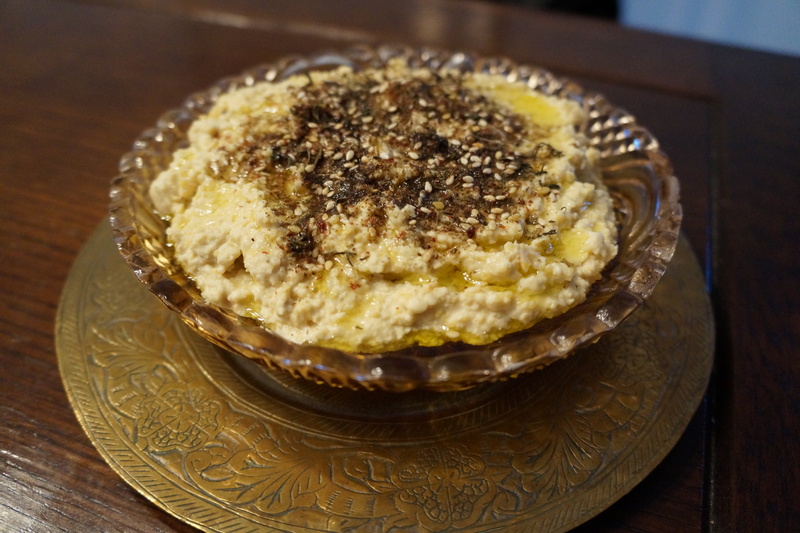 As part of my promotion of sumac, I would be remiss not to write about za’atar, a tangy Middle Eastern mix made of herbs, sesame seeds, sometimes spices, and often sumac, the latter being indispensable in my mind. 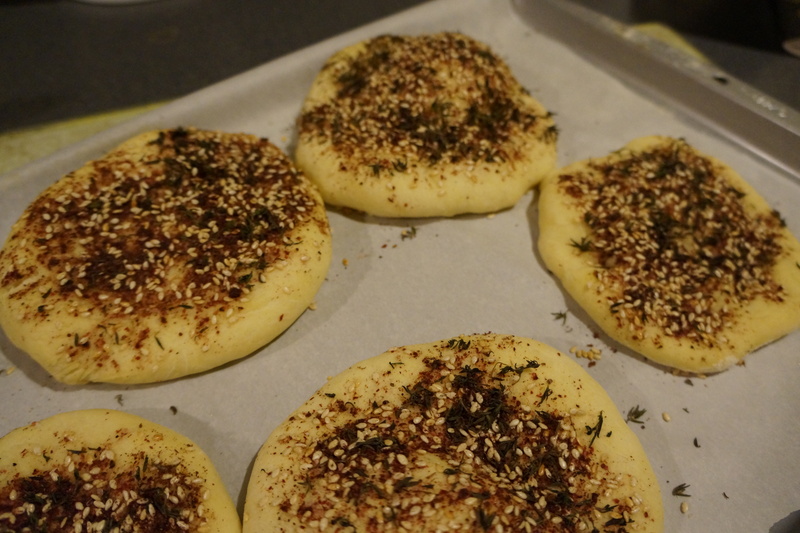 I was introduced to it as a topping on pita bread, but it is also served with plain pita, dipped first in olive oil and then in the za’atar. I have since learned to use it in dressings, with vegetables, meat, fish, sprinkled on hummus or yogurt, in short just about everything but dessert. It makes a pretty amazing addition to bread and butter too, especially a good, fresh, home-made variety. It is easily found in any Middle Eastern shop, and each time I have bought it, it has been a little different from any other. 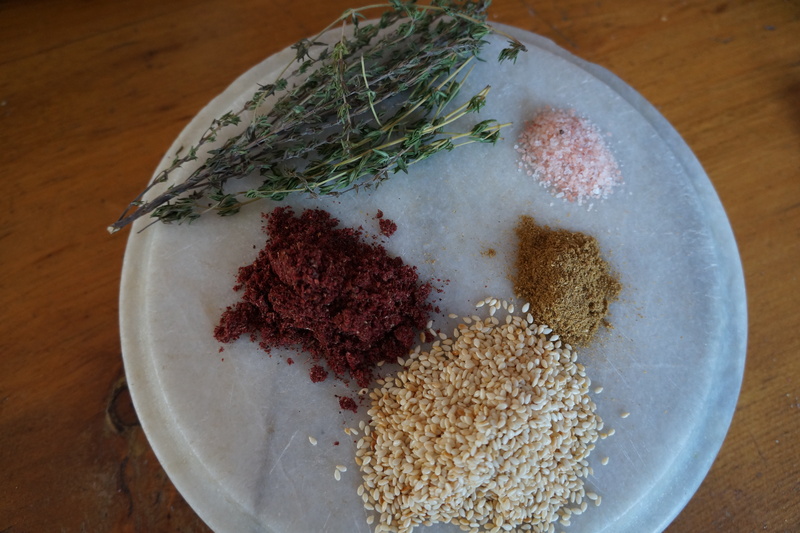 That is because the mixture can have only a few ingredients or many, dried or fresh herbs, with or without spices and with or without sumac. The za’atar I have bought keeps very well for as long as most dried herbs, which means it has probably already lost a lot of its flavour by the time I buy it. So I decided to make my own mixture with what I had on hand. The result was recognizable, but much zippier than any I had bought, and a much prettier colour. You can actually taste the different ingredients, but the overall flavour is unlike any other. If you use dried herbs, it will keep longer, but I think if you have some fresh ones, use them. Make as much as you can use in a week, and keep it in a sealed container in a cool place. This amount I was able to use easily in two days, and I look forward to my next batch soon. You can also use dried or fresh marjoram or oregano as well as thyme, and in any proportion you like. This recipe just serves as a base – no need to follow it slavishly! Categories: spice, wild fruit | Tags: locavore, Middle Eastern, sesame seeds, spice mixture, sumac, thyme, za'atar | Permalink. It is -20 degrees C today and dropping, so I make no apologies for not foraging today. I didn’t even make it outside. 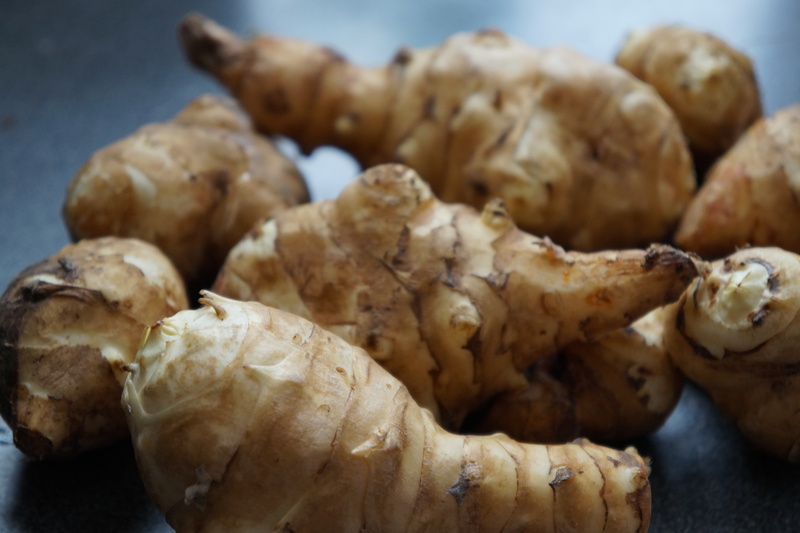 What I am doing is figuring out what to do with my foraged bounty and which ingredients are worth gathering and which just don’t work that well, or do not survive storage. 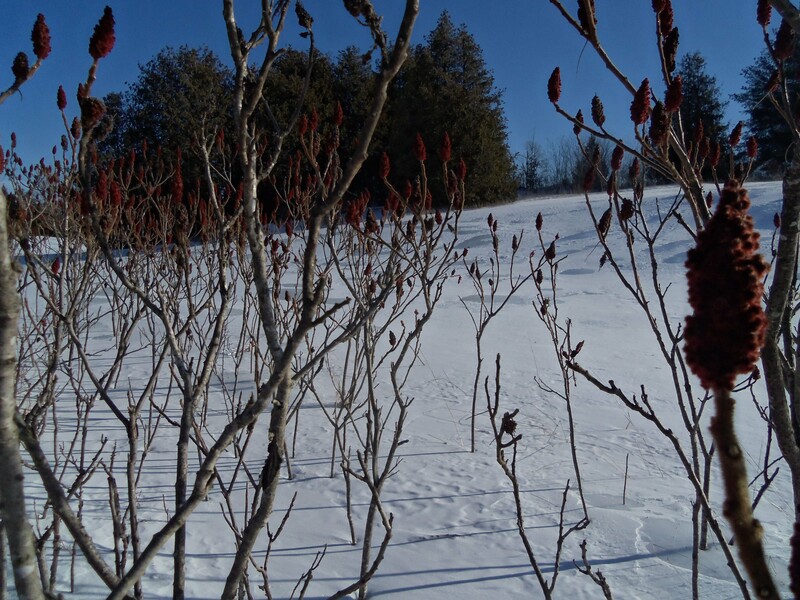 One of my favourite and most useful harvests this year has been the sumac, especially in powdered form. I have noticed that it is one of those increasingly popular spices, although still under-used. And as for local sumac, there seems to be none used whatsoever, even though the red sumac we gather here is similar to the product bought in specialty spice shops. If you are not sure how to identify it, watch this clip. Even those who are familiar with it sometimes need to know how they can use it. I usually just say ‘on anything at all’, but no doubt it would be more useful to give some actual recipes. I have already commented on this spice in my original post, but certain points bear repeating. If you don’t have any of your own, you can buy it in shops. The store-bought is not always organic, and sometimes salt is added to give it bulk, so the home-made is preferable, but not essential. It adds a fruity, lemony flavour to vegetables, dressings, fish, meat, in short, just about anything. I even added it my shortbread with excellent results. Today, taking refuge from the cold weather and icy roads, I made two vegetable recipes; grilled portobello mushrooms and Brussels sprouts from the last remaining fresh sprouts from my garden. 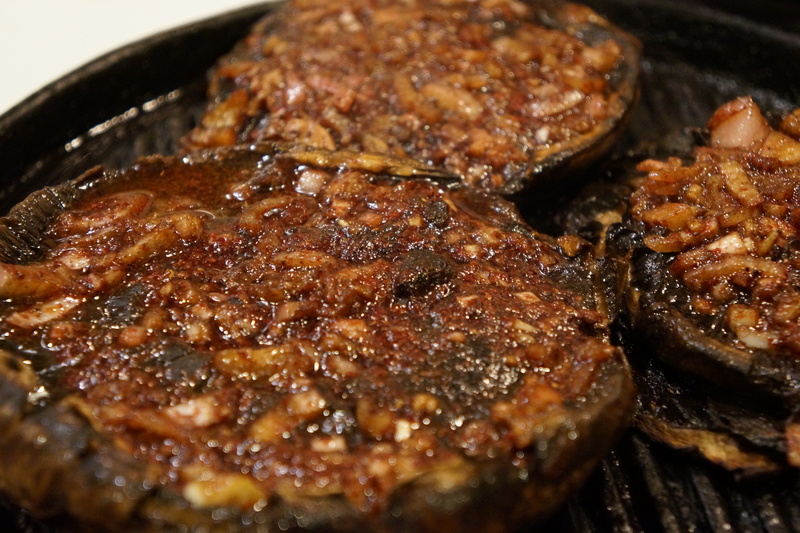 The portobello mushrooms are inspired by a recipe I found on line from Allrecipes, and it comes with a video. I made a few changes, mostly the sumac. Clean the mushrooms, pat dry and remove the stems. 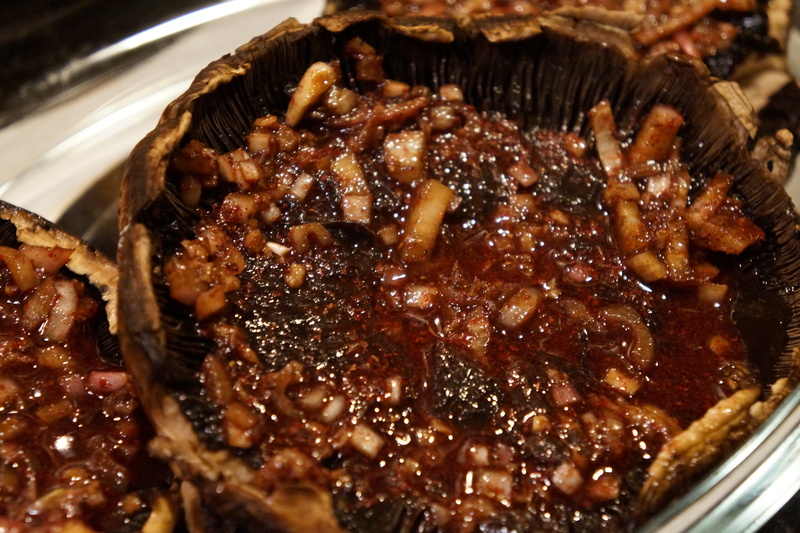 Mix the oil, vinegar, onion garlic and salt in a bowl and pour over the turned up side of the mushrooms. Leave them to marinate for about an hour. Grill them on a lightly oiled grill gill side up until cooked through, about 10 minutes. You will see the sauce bubbling on top of the mushrooms when they are ready. Coat the sprouts with oil and salt. They can be roasted in the oven, but I sauteed them in a pan with the oil and salt and added the sumac just towards the end. If they are getting too browned but still too undercooked for your taste, add just a little water to barely cover the base of the pan, and continue to cook covered for a couple of minutes. Do not overcook! This is a good method when the sprouts are not all the same size, even after halving the larger ones. I put the bigger pieces in first, then added the very small ones later. This barely scratches the surface of things you can do with sumac powder, but as I work my way through my bag of red powder, I will post more of my experiments. Until then, I would be interested to know if anyone else has been using this spice in ways we have not yet thought of. Categories: garden vegetable, spice | Tags: Brussel sprouts, foraging, local food, portobello mushrooms, powdered sumac, side dishes, sumac, vegan recipe, wild edibles | Permalink. Wishing a Happy New Year to all my readers, and all the best for 2014. And, as in any post, there must be a photo. So here is my updated centrepiece, except for the candles entirely made of foraged materials from within a few feet of our house. As it is all natural, it needs to be refreshed every few days, and changed according to the colour of the candles. This one consists of pine, spruce, cedar, sedum and hydrangeas. The base was made from a branch of our sugar maple in the front garden, and the candle holder is a piece of birch tree next to our house that sadly had to come down. Categories: crafts | Tags: centrepiece, dried sedum, Hydrangea, natural decorations, New Year | Permalink.